Guns N’ Roses opened the South American leg of their Not In This Lifetime world tour in Lima, Peru on October 27 and video from the event is available. The reunited trio of Axl Rose, Slash and Duff McKagan performed a 23-song set at Estadio Monumental that followed the format of the group’s summer stadium shows in North America. With a lineup rounded out by guitarist Richard Fortus, drummer Frank Ferrer and keyboardists Dizzy Reed and Melissa Reese, the band delivered material from their legendary catalog, including 1987’s smash “Appetite For Destruction” – the biggest selling debut album of all time with more than 30 million copies sold worldwide. The month-long run across South America will be followed in the new year with dates in Japan, New Zealand and Australia. 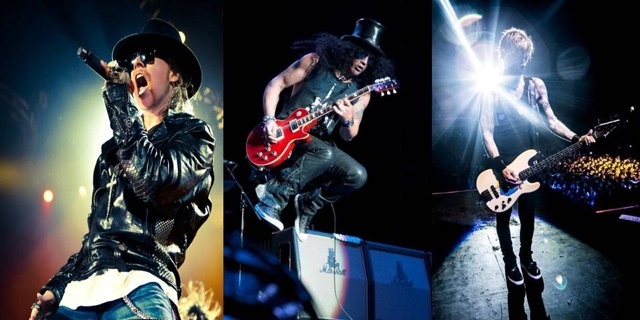 Guns N’ Roses will next perform at Estadio Nacional in Santiago, Chile on October 29.